What's new in Generation 4? more even color mixing and superior coverage. The G4 provides more coverage than the previous Radion models? optimal PAR zone as compared to previous Radion generations. How do HEI Optics work? usable lighting area. PAR testing shows the increase in this area to be substantial. Will all of the existing Radion mounting accessories work with Generation 4 Radions? What is the warranty on Generation 4 Radions? of that in international markets. Will the Generation 4 Radion be compatible with EcoSmart Live and my ReefLink? Can the output of a Generation 4 Radions be matched to Generation 3 Radions? Will there be an upgrade path for previous-generation Radion owners to G4? the G4 and previous-model Radions are minimal. Can the HEI lenses be used on previous-generation Radions? baseplate of the Radion is different. How long will the G3 and G3PRO Radions be supported? Yes. 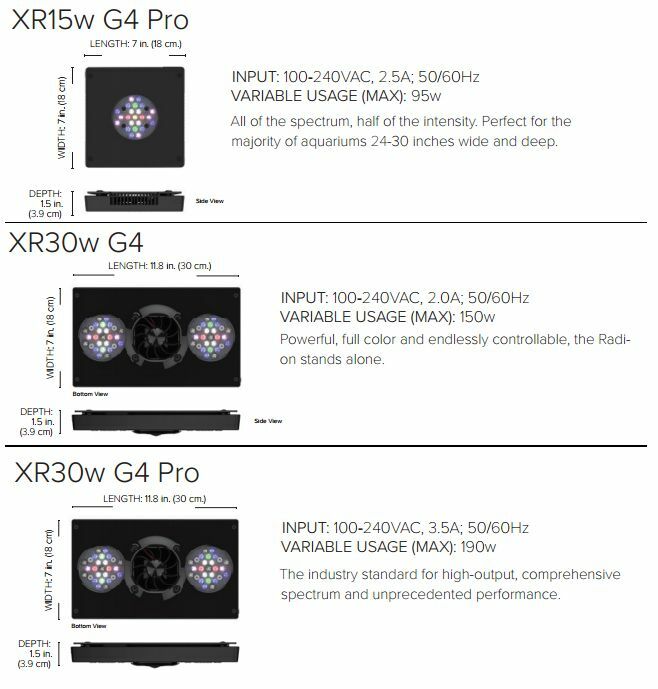 We will continue to offer G3 and G3 Pro upgrade kits for foreseeable future.